The Ever After Pop Up Opera is back for 2018 - join us! We specialise in weddings here at Ever After. It’s all we do. I often get asked if we’ll hire the venue for birthdays, anniversaries, graduate balls. The answer is always no, we just do weddings. 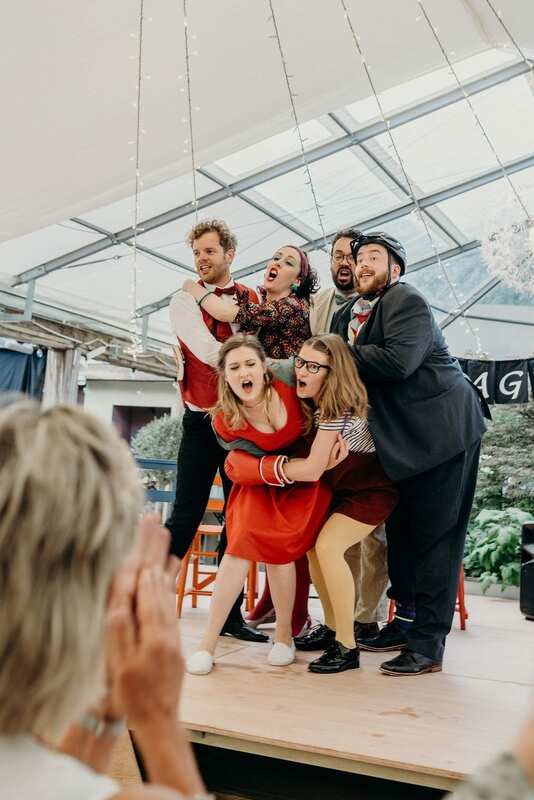 Our one exception is for the last couple of years we’ve held a Pop Up Opera put on here at the venue for one night a year only by the Pop Up Opera Company. This is a touring opera company which takes opera into unusual and intimate spaces, challenging the way opera is performed. Tickets are much cheaper than normal eye-watering prices. The company is completely unfunded so has no grant funding from anywhere. They’ve had rave reviews from The Evening Standard, The Times and Time Out. Pop Up Opera bring their own projected translation in case your Italian is not what it might be, their witty translation and emojis are a big part of the enjoyment. The singing is top notch, unbelievable. You get the chance to experience a great evening out with first class entertainment and you get to be here at the venue without having to bag a wedding invite or get married – win! We have a pay bar, our ice cream trike, a food option and everything you could want for an amazing evening. The gardens are open before the opera so you can wander around and if the weather is good have a pre-performance drink outside. The opera has become increasingly popular, last year we sold out. I already have a list of people who want to be notified as soon as tickets are available. If you want to be added to that list to get a heads up email when the tickets are going on sale, let me know. Tickets will be £30 each – a complete bargain for such amazing quality opera! Drop me a line at nicola@lowergrenofen.co.uk A lot of people are going to be disappointed this year not to get tickets – don’t be one of them! This is your chance to put your name down, secure your tickets and enjoy a wonderful evening in a special place. All photos Clare Kinchin Photography.